Shopaholic site - shopping, outfits, fashion, beauty, traveling and lifestyle blog: Mamma mia! It's got to be Musicals week or something, in our last night in London we went to see "We will rock you", a musical with more than 20 of Queen's songs, and the first thing we did back home was to go see "Mamma mia", another musical, but this time a movie. 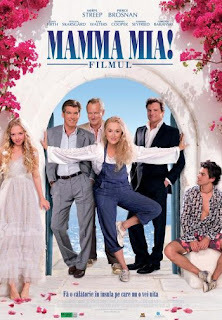 Mamma mia is a highly successful musical, based on the hit ABBA single of the same name, first opened in London on April, 6th, 1999. Now you can see this easy-going funny musical in several places, including New York, Las Vegas, London or Moscow. It is the story of a young girl that will get marry soon, but before that wants to know who her real father is. According to her mother's journal, there are 3 possibilities. So she invites them all to the wedding, hopping that she will instant recognize her father. The movie features Pierce Brosnan and Meryl Streep, and has the almost exact plot line as the musical. It is the perfect way to spend 2 lazy weekend hours, enjoying good music (I didn't expect all the actors to sing so well) and gorgeous Greek scenery.